represents a three-dimensional graphical image. 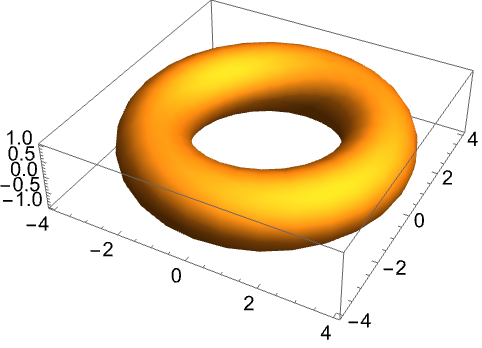 Graphics3D is displayed in StandardForm as a graphical image. In InputForm, it is displayed as an explicit list of primitives. ImagePadding All what extra padding to allow for labels, etc. Nested lists of graphics constructs can be given. Directive specifications such as GrayLevel remain in effect only until the end of the list that contains them. In a notebook front end, ViewPoint, ViewVertical, ViewCenter, and ViewAngle can be changed by direct interactive manipulation. 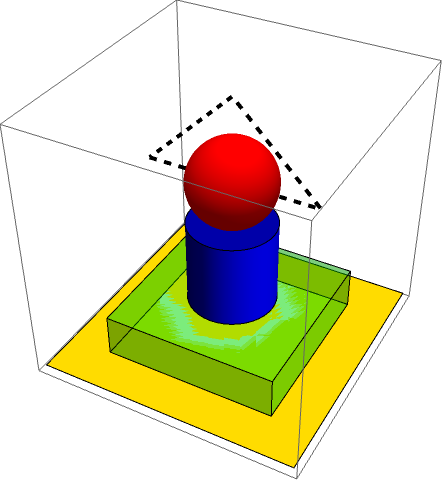 Dragging with the mouse rotates a 3D graphic. Directives such as RGBColor specify surface colors for objects that follow. 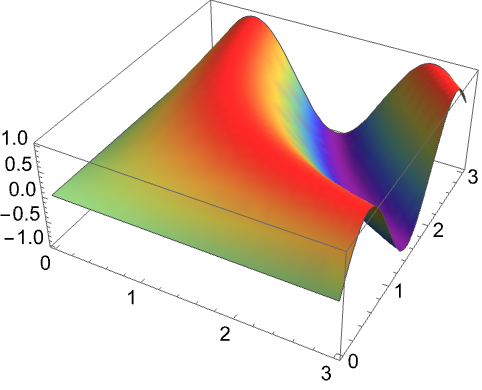 Final colors are determined from simulated illumination, including Glow and Specularity components. By default, four light sources of different colors are used, arranged at particular fixed locations outside the bounding box. By default, ViewAngle is set so that, if possible, the projection of the whole 3D object just fills the 2D viewing area. The settings for BaseStyle are appended to the default style typically given by the "Graphics3D" style in the current stylesheet. The settings for BoxStyle, LabelStyle, etc. are appended to the default styles given for "Graphics3DBox", "Graphics3DLabel", etc. Graphics3D gives an empty 3D graphic.